One of the first Amontillados to leave a lasting impression on me was Amontillado La Garrocha from Bodegas Grant. It’s a small, family-owned bodega in El Puerto de Santa María. Like many small bodegas, they do not have their own vineyards, but purchase their grape must from other growers. Since its founding in the mid 1800’s, they’ve mostly functioned as almacenistas selling their wines to replenish soleras in other sherry houses. It’s only been recently that they’ve bottled under their own label. 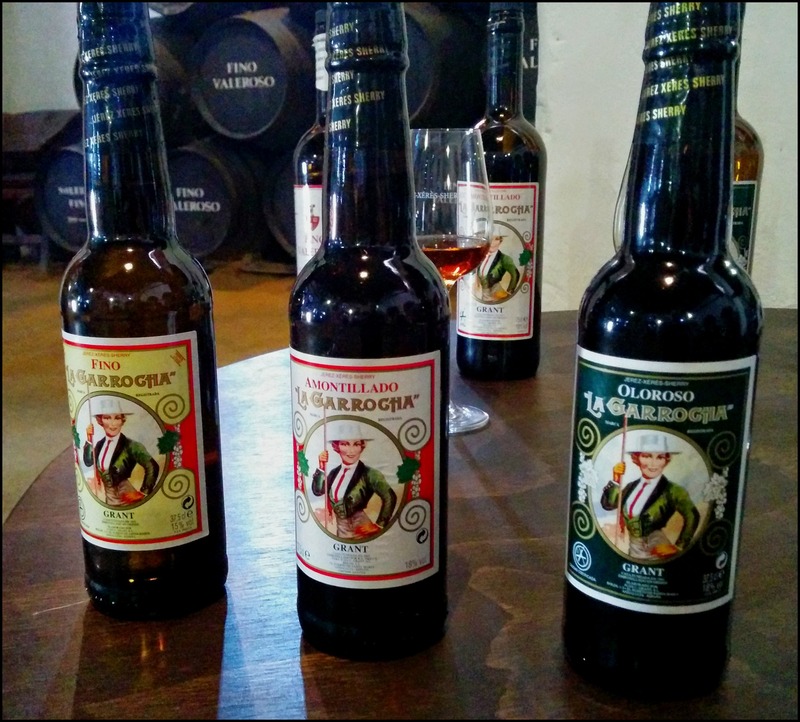 It was highly recommended that I make a visit while in the Sherry Triangle. It was my first train experience venturing outside of Jerez all on my own. I admit, I was a little nervous walking down unfamiliar streets using my phone to guide me. I arrived at the bodega’s storefront much earlier than my appointment. The kind lady inside said I could wait in the café just around the corner. I sat down and ordered a café con leche. A man reading his paper at the end of the bar shyly introduced himself at Edmundo. He remained behind his paper, occasionally making conversation until his father, Edmundo Sr., arrived to greet us both and paid the tab. The café was conveniently attached to the back entrance to the bodega. It’s a lovely space, full of light, yet managed to keep out the day’s growing heat. Compared to his tall, shy son, Edmundo Sr. was an average height Spaniard full of animated gestures as we tasted wines from their barrels. He explained that unlike Jerez, the flor yeast in El Puerto does not vary in thickness since the temperatures aren’t as extreme in winter or summer. Edmundo Sr. walked over to a Fino barrel and had to chisel open the bung. 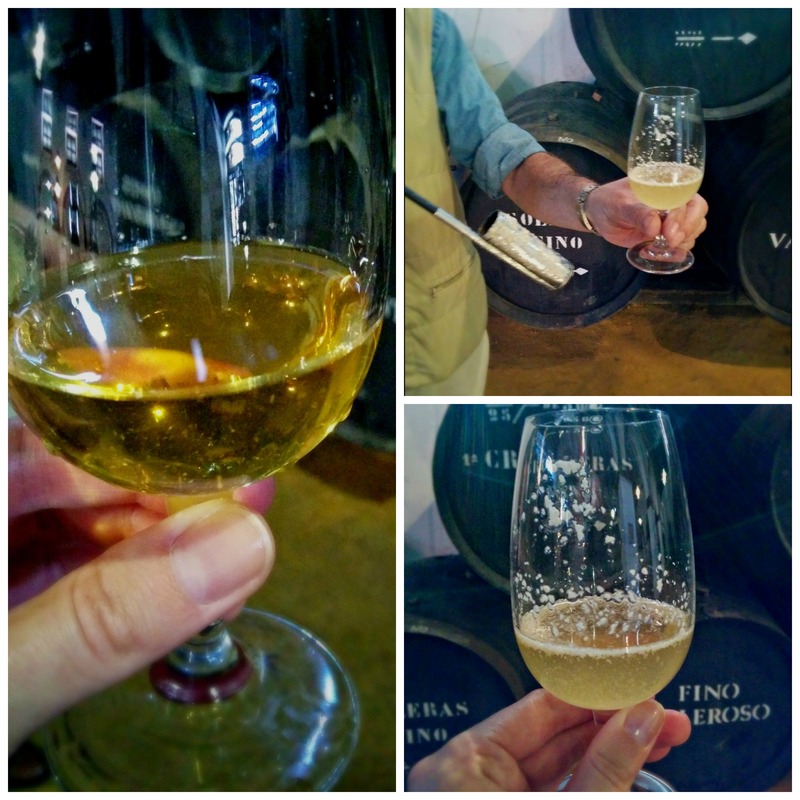 He handed me a glass of Fino wine mixed with the flor to taste how it influences the flavor. I was surprised by the pungent aroma of fresh almond and its subtle sweetness. The flor not only influences the wine’s nose and flavor, it’s key for protecting the wine from oxygen. When I tasted the Fino on it’s own, the aroma of the flor was still present, yet the wine was bone dry for being only three years old. They don’t currently bottle en rama, or unfiltered Fino, for export markets. Perhaps they will in the future, but for now it’s only available for local patrons. Next, he poured me a glass from the La Garrocha Amontillado barrel. Magnífico! I’ve never had anything so fresh! Truly trumped my initial experience back in Oregon! Once the flor dies and oxygen is exposed to the wine, their Amontillado is ready for bottling after aging approximately 9 years. I could taste the Fino influence, but the body was much fuller and richer. The color was a beautiful topaz and the nose was a balance of almonds and toffee. As I continued to taste through, Edmundo Jr. participated more in conversation, especially explaining to his father I already knew my sherry basics. Our conversation transitioned to their excitement of their growing export market. 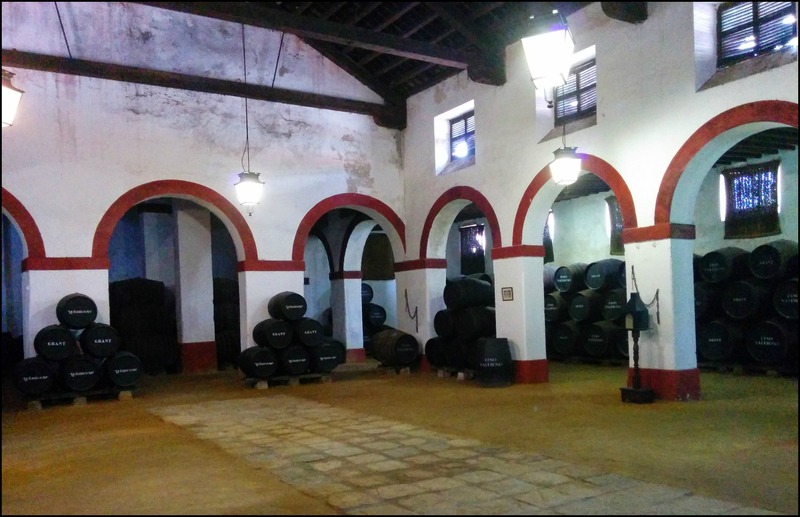 Currently they only export half-bottles of the La Garrocha Fino, Amontillado and Oloroso. Their first shipment was 300 cases, and just last year they exported 1500 cases! We walked over to a table where they set up the remaining flight of their La Garrocha wines. Oloroso always smells like it would be sweet, but it’s bone dry on the palate. This one had a lovely citrus finish. Although I prefer dry sherries, I wasn’t going to turn down their sweet ones. The less sweet of the three was the Cream. Their Cream is a blend of the Oloroso with a splash of Pedro Ximénez for added sweetness. It smelled like raisins and had a beautiful amber color. The Moscatel surprised me. It reminded me of honey, yet it wasn’t empalagoso, or overly sweet. Unlike the Pedro Ximénez, which coated my mouth like syrup and lingered. It’s smell took me back to being a child eating out of a snack box of Sun-Maid raisins. 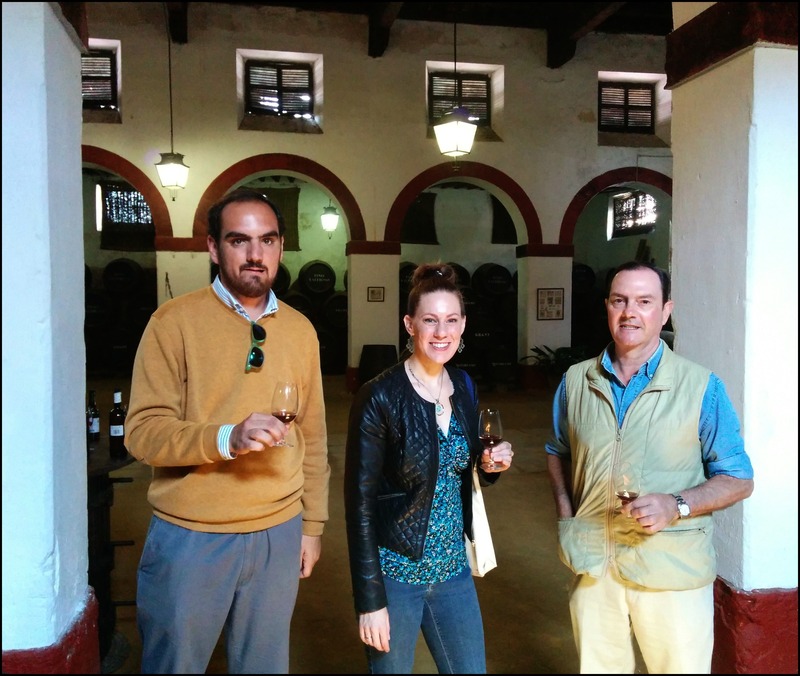 We ended our visit toasting with a glass of a Amontillado Viejo averaging 20 years old. I asked them to sign my “sherry bible” before they sent me off with a gift of a signed poster and a bottle of La Garrocha Amontillado. They highly recommended I return for harvest next year. I just might take them up on it!